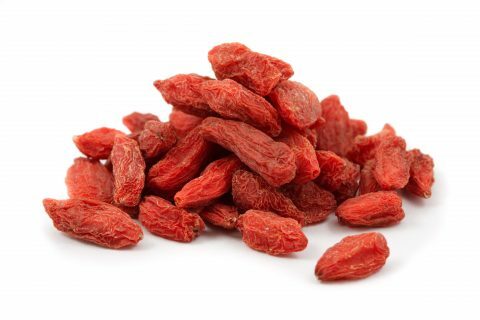 The Goji berry (also known as the Wolfberry) is the common name for two species of Boxthorn (Lycium Barbarum and Lycium Chinense). They are both native to Asia and have been used in traditional Asian cooking as well as Chinese, Korean, Vietnamese and Japanese medicine since the 3rd Century. . The origin of its common English name, “wolfberry” is unknown. It may have arisen from the mistaken assumption that the Latin name Lycium was derived from Greek λύκος (lycos) meaning “wolf”.